I am trying to understand the time stamp for form submissions. It appears that several are stamped many hours into the future. 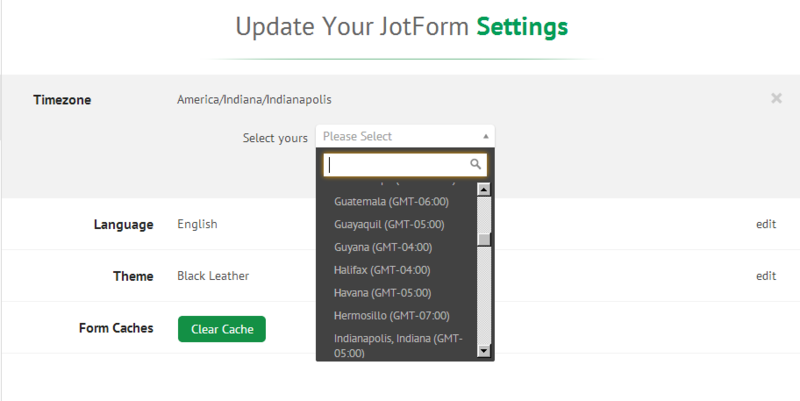 For an example, the submission date/time for several respondants of form http://jotform.net/form/3494804184 are this afternoon. Please advise. I'm not sure about the default settings of the server but to be able to get the submission time stamp to your own time, please go to your Account Settings page, you will find this account settings button link on the same area where you usually login to your JotForm account. Once you are already on the account settings page, select your time zone. This will fix your time stamp to the time zone of your choice. I cannot access my account settings to set the timezone. It shows a log in screen (even when I am already logged in) and even though I log in again, the login does not go away and does not allow me to access the settings. I cannot replicate same error in my end. Can you please try to clear your browser cache then try it again. Thanks! I cleared cache and still could not access settings in Firefox (my Browser of choice). I logged into my account with Chrome and was able to access the settings. It appears to me to be a Firefox specific issue.